On the 17th April we travelled from St Arnaud via Bendigo with our final destination being Healesville, where we had booked accommodation for two nights to enable the Yarra Ranges National Park and Mount Donna Buang to be activated. Even though it was Easter the roads were not too busy and we found ourselves with some spare time, still allowing arrival at Healesville in daylight. I could feel Kinglake National Park calling! Kinglake National Park is in a number of blocks and we did not think we had enough time to get to Mount Disappointment. We chose the Womelano Block taking Eucalyptus Road off the Melba Highway. We drove back from the Gums Camping Area and soon found another track into the Park which we took. The track is pictured below and the barrier was locked to prevent further access (by vehicles) into the Park. We had the place to ourselves. It was a magnificent location, although as you can see, the trees had been scarred by fire. The walking/fire management track (JCD photo). Burnt trees and re-growth (JCD photo). My operating position, about 300 metres inside the Park, near the boot-cleaning facility for Phytophthera which is a ‘fungus-like’ organism that destroys healthy plants in the Park (JCD photo). VK5PAS/P Both stations were in Scott Creek Conservation Park, VKFF-0264. I was pleased to get Marija and Paul in the log. VK6ADF/P, 52 and 51. A pretty good contact with Phil on 40 metres across the continent. 05:39 VK5WOW, Scott Creek Conservation Park, operator VK5PAS. 05:47 VK5AFZ/P, Bob activating Lawari Conservation Park, VKFF-1767, for the first time. See my post on the ‘stolen park’ for more information. At 06:20 I thought I should close down, pack up and head for Healesville. Thanks to all who gave me a call at Kinglake National Park. All callers are greatly appreciated. I have fond memories of Kinglake National Park and I suspect it was the first National Park I ever activated. 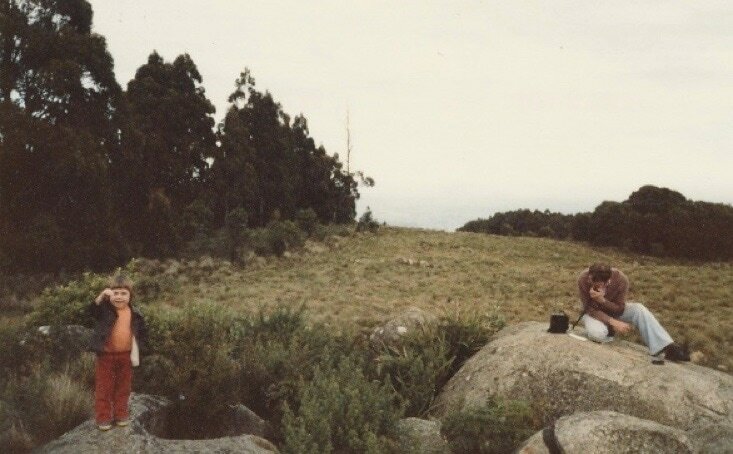 This photo shows VK3BJE activating Kinglake National Park and Mt Disappointment, circa 1978, pre-SOTA and the wwff program. The radio is an early ICOM, an IC 215, a 15 channel two-metre FM radio, putting out three watts. I really enjoyed this radio and providing one kept within a reasonable distance of Melbourne with some elevation contacts were pretty well assured on 146.500 FM and via the repeaters which were really widely used then. My son, Julian, is in the foreground on the left. My rather battered ARRL Minilog shows at least three trips to Mount Disappointment and that I had operated portable on many occasions and locations in VK3 as well as in VK1, VK2, VK4 and VK7. The radio even came with me on interstate work trips in my luggage. I hope you enjoy my reflection on the past!